The Pirani Score is a simple and reliable system to determine severity and monitor progress in the Assessment and Treatment of Clubfoot . This Scoring System uses the different views of the foot to help visualize the issues in the underling soft tissue and bony anatomy. A foot can be assessed in less than a minute and no technical equipment is required. Developed by Shaque Pirani, a Canadian Orthopaedic Surgeon, who assisted in the development of Clubfoot Services in Uganda and Malawi, it is an easy to use tool, developed to assess the severity of each of the individual components of Clubfoot. It is used both as a means to assess the severity of the Clubfoot at initial presentation and for ongoing monitoring of the patients’ progress. The Pirani Clubfoot Score documents the severity of the deformity and sequential scores are an excellent way to monitor progress. An increase in the Pirani Score between visits may be an indication that a relapse in the Clubfoot Deformity is occurring. During Ponseti Management of Clubfoot, the Pirani Score Record shows whether the deformity is correcting normally or whether there is a problem, and the degree of correction of each component of the clubfoot. The Pirani Score is also utilised to assist in determining when to perform the Tenotomy. As highlighted by Dyer et al  and others there is significant positive correlation between the initial Pirani score and number of casts required to correct the clubfoot deformity. A Pirani Scoring 4 or more is likely to require at least four casts, and one scoring less than 4 will require three or fewer. A foot with a hindfoot score of 2.5 or 3 has a 72% chance of requiring a tenotomy, which is done when the midfoot score is less than 0.5. The Pirani Score System is reliable, quick, and easy to use, and provides a good forecast about the likely treatment for an individual foot but a low score does not exclude the possibility that a tenotomy may be required. The Pirani Score is intended for use as a means to assess the severity of the clubfoot at initial presentation and for ongoing monitoring of the patients’ progress. Scoring the foot at each visit during treatment enables the health care worker treating the child to document how the foot is responding to manipulation and casting.Many degrees of severity and rigidity of Clubfoot are found at birth. Failures in treatment are related more often to faulty technique of manipulation and casting rather than severity of deformity. The examiner is seated. The infant is on the mother’s lap. A feeding, relaxed infant allows a more precise examination. The measurements are made while the examiner is gently correcting the foot with minimal effort, and no discomfort. If the Midfoot Contracture Score (MFCS), the Hindfoot Contracture Score (HFCS), and the Total Score (TS) are plotted on a simple graph against time, you can follow the improvement of the foot. Achilles Tenotomy is the final part of correcting a clubfoot. The Pirani Score can indicate when the foot is ready for a tenotomy. The graph below shows the effects of Ponseti Treatment and Tenotomy on the MFCS, HFCS, and TS. The MFCS drops rapidly with manipulation and casting whereas the HFCS remains high. 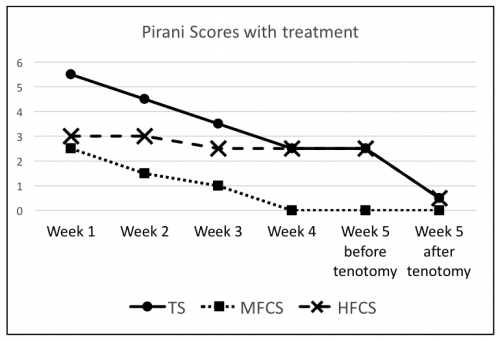 The tenotomy is done in Week 5 when the MFCS has less than 0.5 but the HFCS remains greater than 1. After the tenotomy, the HFCS improves from 2.5 to 0.5, but does not correct completely. The Pirani Scoring system has been found to be both valid and reliable, unlike many other Clubfoot Scoring Systems, which are untested. A higher Pirani Score on presentation may indicate that a higher number of casts will be required, and as such can play a key role as a means for predicting treatment outcomes. In a child with a high initial Hindfoot Contracture Score (HFCS) the likelihood to experience relapse of deformity during the bracing phase is much higher than in those with lower scores and should have close monitoring with special emphasis put on the importance of the use of Foot Abduction Brace when educating parents/carers. Mejabi et al  described the Pirani scoring system as a reliable system to determine severity and monitor progress in the treatment of clubfoot. Their study showed significant correlation (p<0.001) between the midfoot score, hindfoot score, Pirani score and the number of casts to achieve correction. Also, there was correlation between the Pirani score and the need for tenotomy (p<0.001) and the progress of treatment can be monitored with the Pirani score (p<0.001). Piarani et al  demonstrated validity of the Piarni Score with excellent inter-observer reliability by evaluating this clinical scoring system by correlating MRI and clinical scores. ↑ 2.0 2.1 2.2 Dyer PJ, Davis N. The role of the Pirani scoring system in the management of club foot by the Ponseti method. Bone & Joint Journal. 2006 Aug 1;88(8):1082-4. ↑ 3.00 3.01 3.02 3.03 3.04 3.05 3.06 3.07 3.08 3.09 3.10 3.11 Africa Clubfoot Training Project. Chapter 4 Africa Clubfoot Training Basic & Advanced Clubfoot Treatment Provider Courses - Participant Manual. University of Oxford: Africa Clubfoot Training Project, 2017. ↑ Goriainov V, Judd J, Uglow M. Does the Pirani score predict relapse in clubfoot?. Journal of children's orthopaedics. 2010 Aug 29;4(5):439-44. ↑ Goriainov V, Uglow M (2010) The value of initial Pirani score assessment of clubfoot in predicting recurrence. (British Society for Children’s Orthopaedic Surgery conference proceeding) in The Journal of Bone and Joint Surgery 92B, Supp_III, 376. ↑ 8.0 8.1 Shaheen S, Jaiballa H, Pirani S. Interobserver reliability in Pirani clubfoot severity scoring between a paediatric orthopaedic surgeon and a physiotherapy assistant. Journal of Pediatric Orthopaedics B. 2012 Jul 1;21(4):366-8. ↑ 9.0 9.1 Jillani SA, Aslam MZ, Chinoy MA, Khan MA, Saleem A, Ahmed SK. A comparison between orthopedic surgeon and allied health worker in Pirani score. J Pak Med Assoc. 2014 Dec;64(12 Suppl 2):S127-30.